Picture above is our custom built "Wood-Fired" Brick Oven. is baked... just like in Naples, Italy. Our number in Arlington, TX. is 817-561-CORKYS(2675). We are in Lincoln Court Plaza at 4760 Little Rd. HOURS TUESDAY TO THURSDAY 11 AM - 9:00 PM. FRIDAY & SATURDAY 11 AM - 10:00 PM. New York Style pizza, but it's NOT true "Old World Italian" Neapolitan pizza. But it's NOT "Old World Italian" Neapolitan pizza. really KNOW whether or not it is truly Authentic Old World Italian Neapolitan pizza? Well here are a few facts you should know. Italian Neapolitan pizza came in to existence in 1889 in Naples, Italy. Created by a famous “Pizzaiolo (Pizza Chef) for Queen Margherita. 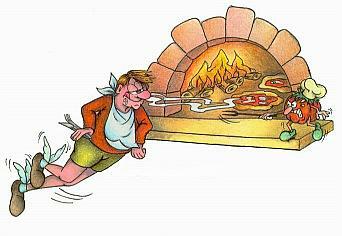 Pizza was baked directly on the deck of an open hearth in a coal or wood-fired custom-built brick oven, as shown in the picture above. the deck until it is removed, usually anywhere from 3 to 5 minutes! professionalism. 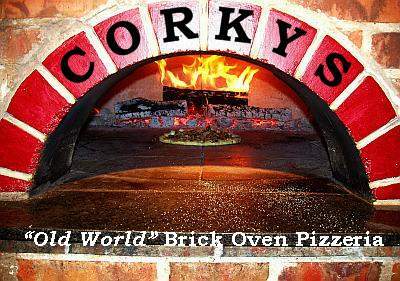 That's exactly how we bake our pizza's at Corky's. Baking with any other oven is simply NOT authentic "Old World Italian Neapolitan pizza." Pictured above is a typical Deck Oven. This oven was designed to be simple and easy. It operates with either gas or electric and doesn't require special baking skills... and very popular in America. Authentic "Old World Italian" Neapolitan pizza. Pictured above is a "conveyer belt oven". 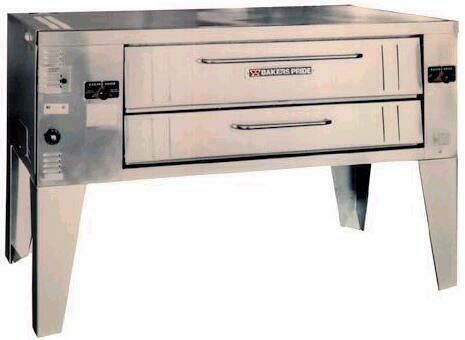 This oven was designed to be even simpler and easier than the deck oven. It also operates on gas or electric and can be operated by literally anyone. It is used by almost all of the pizza chains for baking typical "Fast-Food" American pizza. If your pizza is baked in a “conveyer belt oven” it is certainly NOT authentic "Old World Italian" Neapolitan pizza. Next... what about the sauce. Most pizza is made with a prepared canned "pizza sauce" and "doctored" with dry seasoning. This is typical American "Fast-Food" pizza. 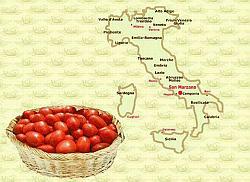 Unless your pizzeria is grinding select Italian peeled plum or pear tomato's right from scratch... like the famous Plum tomato's grown in the San Marzano valley of Italy... then seasoning the ground up tomato's with "fresh herbs"... it's NOT authentic Italian Neapolitan pizza! That's exactly what we do at Corky's. Next, let's talk about the dough or the crust. Another very important component of a high quality product. Many pizzeria's use a "high gluten" flour. A high gluten allows for more flexibility in stretching or tossing the dough for a visual effect. Unfortunately dough made from high gluten flour is very chewey, almost like chewing bubble gum. Your jaw gets tired after a while. We believe in less gluten, less show, and tasty and tender to the bite. Made with an "Old World" family receipe that is simply divine. Let's talk about the olive oil. I'm sure you've heard the "trigger" words before... "Extra Virgin" olive oil... even "Extra, Extra Virgin olive oil"! Bottom line is... the all important key phrase is "First-Cold Pressing"... or "First Cold-Pressed". Which means no heat filtering or heat processing. Translation... if you put a glass of olive oil in the fridge it will coagulate and become solidified... "First-Cold Pressed olive oil will remain liquid for some time... and the flavor is simply unmatched and it is simply better for us. It's all we use at Corky's. High quality Premium toppings are another very important component. 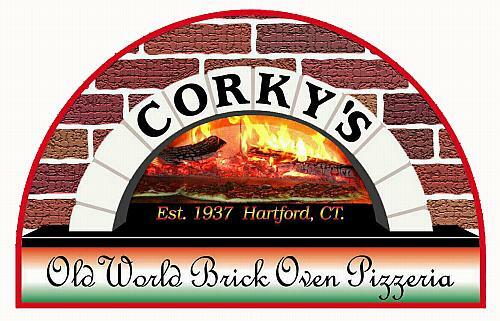 Read about our toppings on the "CORKY'S TX." page.